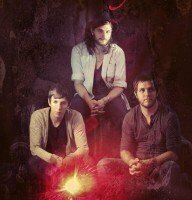 Austin based indie rock trio The Rocketboys have debuted a brand new song, “Bloodless,” from their long-awaited new full-length album, Build Anyway, which is scheduled for release on June 5. Stream “Bloodless” now. Recorded in their home studio and mixed by CK Eiriksson (U2, Live, Phish), Build Anyway chronicles the emotions that surface through the brokenness in abandonment to the search for peace and closure, both personally and musically. Frontman Brandon Kinder conveys the feelings dreamily as he paints a haunting, yet heartfelt picture with his rich crooning vocals on the album’s debut track, “Bloodless,” giving fans a preview of what’s to come on Build Anyway. Build Anyway is set for a June 5th release. The band will be touring nationally May-August; additional dates will be announced soon.